‘Return to Telos’ marks the finale of the fourth run of The Fourth Doctor Adventures and the conclusion to the more character-driven openness of ‘The Fate of Krelos.’ With the advertised return of the Cybermen and Jamie as the Fourth Doctor and Leela intrude upon the Second Doctor’s earlier adventure to Telos, it’s fair to say that ‘Return to Telos’ is one of the most eagerly-anticipated titles in the range to date. Nicholas Briggs both writes and directs ‘Return to Telos,’ and so it’s not surprising that the pacing and tension are so consistent as a seemingly unsolvable problem presents itself. Unfortunately, the script fails to capitalize on its immensely intriguing hook, instead choosing to focus on simply talking about potential devastating consequences with dialogue laden with clunky exposition and technobabble. Jamie’s kilt was a nice bit of foreshadowing in the previous adventure, but the realization that the deadly mistake made during ‘Tomb of the Cybermen’ now wreaking havoc for the Fourth Doctor is that Jamie rubbed up against cyber-particles that have remained dormant in his kilt until now is rather underwhelming. There is the intrigue surrounding how those same particles have come to result in the Cybermen’s destruction of Krelos through the advent of K9, but even this is realized in a rather circuitous and complicated fashion. Ultimately, even the resolution regarding the particles as K9 attempts to get Jamie near a particulate vacuum cleaner- while tapping into the inherent absurdity of Doctor Who– fails to leave a more positive lasting impression. ‘Return to Telos’ is almost a polar opposite to its opening instalment, focusing on keeping the busy plot moving with lots of developments but not quite managing to achieve an equal balance with characterization. While the story works well enough as it is, it seems odd that two key developments were seemingly omitted. Even without Leela really getting to test her more primal instincts against the emotionless Cybermen, not having the iconic Jamie and Leela finally meet to bridge generations is a gaping hole that can’t help but be noticed. These are two of the most well-developed companions, and they share so much in common despite their different roots that this meeting practically writes itself. 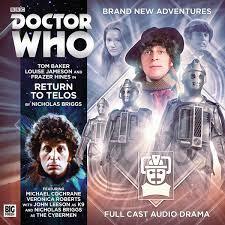 Likewise, while there have been simmering conflicts between Leela’s desire to do right and the Doctor’s need to preserve the web of time in the past, these are seemingly forgotten as the Doctor here simply decides that he is right to use time travel to correct events because the Cybermen had done the same to cause the problem. ‘The Fate of Krelos’ worked quite well as a more intimate and reflective piece without much plot, but, in retrospect, transitioning at least some of the plot here to that previous tale would have created a more streamlined experience while allowing ‘Return to Telos’ to truly explore its characters and central conflict in detail. Taken completely by itself, ‘Return to Telos’ is another satisfying jaunt into nostalgic territory due to its blistering pace and charismatic leads. However, given the possibility of what could have been as two eras of Doctor Who collide, the conclusion fails to deliver anything truly meaningful and suffers from seemingly obvious expectations left unmet. The use of a reset button as a resolution has long been a contentious one, and employing it here does again leave an unrewarding sentiment that underscores the missing potential drama from the release in general.